This is a Reminder that there is a free public meeting in the Hyatt Broad Street this Saturday, 9th Feb – 10am to 12pm. The main subject will be an update on the implementation plans of the Metro Tram extension to run around the town hall, up Broad Street and on to the West side of Five Ways island. The meeting has been created by volunteer members of the City Centre Neighbourhood Forum which supports city dwellers on city matters. 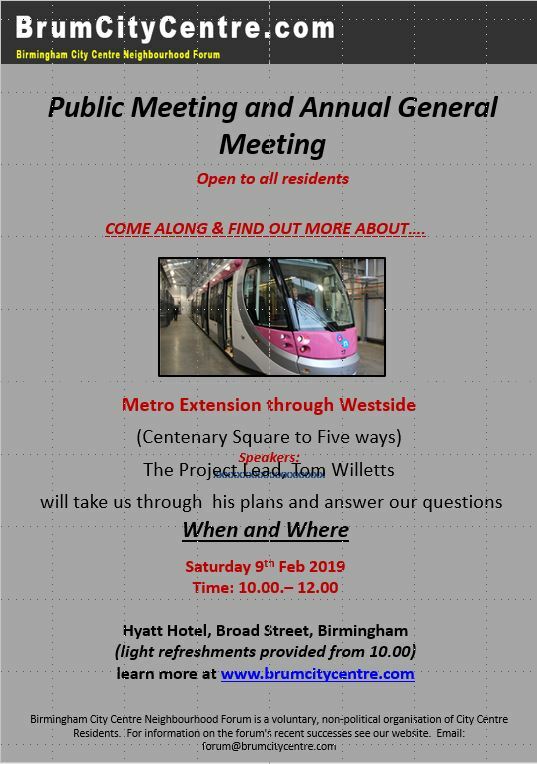 This is an opportunity to ask questions of the Project Lead, Tom Willets from Midland Metro Alliance, the developers. This entry was posted in Metro on February 7, 2019 by Geoff Caine.